‘Tis the season to give back! While we here at Ulla Eyewear make a conscious effort year-round to contribute to our community and donate where we can we work extra hard toward the end of the year to really ensure that we are reaching as many as we can. We are happy to say we have donated over $5,000 to our charities for 2018. Since 1998, we’ve been a proud and active member of the Madison community and feel compelled to give back to the city and the people who have treated us so well. Although there are a number of causes we support, a few in particular have become the headlining causes of Ulla Eyewear. We offer no charge adjustments and minor repairs on both our products and those not purchased from us. In exchange we ask for a donation to the local charity we are supporting that month. All donations are matched by Ulla and donated to that charity! 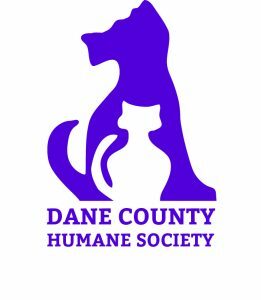 Ulla Eyewear is proud to partner with the Dane County Humane Society showcasing a pup in need of a home weekly on our social media. We’re glad to see that the engagement on these posts are some of the biggest we have and that we’ve aided in the rescue and rehoming of so many dogs here in Madison. Many of our staff have animals and always welcoming a friendly furry face here in the store! 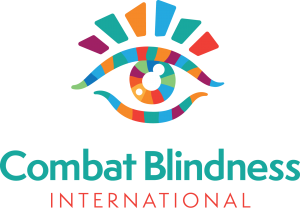 Combat Blindness International was started here in Madison by Dr. Suresh Chandra and we’ve been enthusiastically helping expand their mission and find cures for blindness around the world. As a sponsor of their annual World Sight Day in October we’ve aided in the raising of $70,000 of their $50,000 goal. Combat Blindness provides cataract and other lifesaving eye surgeries around the world for a donation of $20. After months of planning and preparation Ulla Eyewear launched REFRAMED in January 2018. REFRAMED allows customers/staff to sell back gently used frames for an in-store credit. That frame is carefully inspected and refurbished by our staff and sold in our store for $199; allowing us to offer customers a great frame for a fraction of the cost. For every REFRAMED frame sold we donate a vision screening to the Madison Metropolitan School District. Year to date we have supported over 100 vision screenings. As a staff of mostly Madisonians who went through MMSD we love the ability to give back to the schools that taught us and helped us grow. 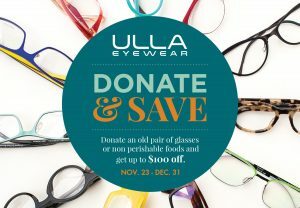 DONATE & SAVE is a promotion we run from mid-November through the end of the year every year allowing us to give our customers a savings of up to $100 on their frame and lens purchase in exchange for the donation of a pair of gently used eyeglasses or a bag of nonperishable food. All glasses donations are given to the Lion’s Club of Madison and food to the River Food Pantry. Last year we were able to donate over 70 pairs of glasses and 122 lbs. of food. We’re hoping we can top that this year!